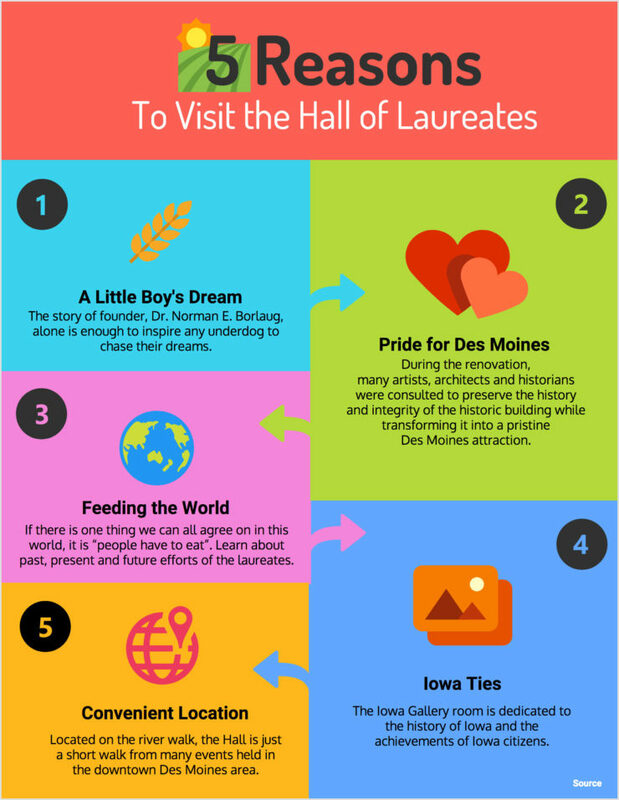 Many Des Moines citizens have noticed the World Food Prize’s Hall of Laureates building. However, many do not know it is more than just a beautiful wedding venue with magnificent gardens or a location to host important business meetings. The Hall of Laureates also tells the story of the World Food Prize journey, including their present state and what is to come. The are many reasons to visit the Hall (other than the fact that it is FREE admission); the 5 best reasons are below. Dr. Norman E. Borlaug was a regular, small town Iowa boy who came to be the founder of the World Food Prize. His story alone is enough to inspire any underdog to chase their dreams. Dr. Borlaug, or Norm as he liked to be called, stayed true to his mission to field the world throughout his life. His research in Mexico won him the Nobel Prize for it is said he saved more lives than any man who has ever lived. This achievement led to his desire for a prize specific to agriculture which became the World Food Prize. If there is one thing we can all agree on in this world, it is “people have to eat”. As Barreca stated, “The issue of world hunger is at the forefront of every country in the world. The WFP highlights those around the world that are fighting this fight, that are working to end world hunger, working to find the many solutions and working to feed those in need.” As the population of the world continues its significant increase, we will need to produce more food, more efficiently. Each year a laureate is awarded the World Food Prize at the international symposium, known as the Borlaug Dialogue, for their works in agriculture and humanitarian efforts. Although you can read about what each of the laureates are doing or have done to help feed the world, their stories can be better told by the docents when visiting the Hall of Laureates. As the old city library sat vacant it was the perfect opportunity to relocate the World Food Prize headquarters. During the renovation, many artists, architects and historians were consulted to preserve the history and integrity of the historic building while transforming into a pristine Des Moines attraction. When speaking with, Nicole Barreca, a member of the staff, she said “The World Food Prize building, is truly one-of-a kind. To find a building over 100 years old that is on the National Registry of Historic Places and is also a LEED platinum building for energy efficiency, is extremely rare and cannot be found (anywhere else) in Iowa.” Anyone with an interest in history and the character of old buildings will marvel at the work that was done to ensure this endeavor. With Dr. Borlaug being from Iowa it was only fitting to bring the World Food Prize headquarters to Des Moines. Mr. John Ruan, Sr. and his family have saved the World Food Prize, and have been loyal philanthropist ever since. The Hall also has a room, known as the Iowa Gallery, dedicated to the history of Iowa and the achievements of Iowa citizens. Visit the Hall of Laureates and you can learn how the World Food Prize was saved and see the Iowa Gallery first hand. 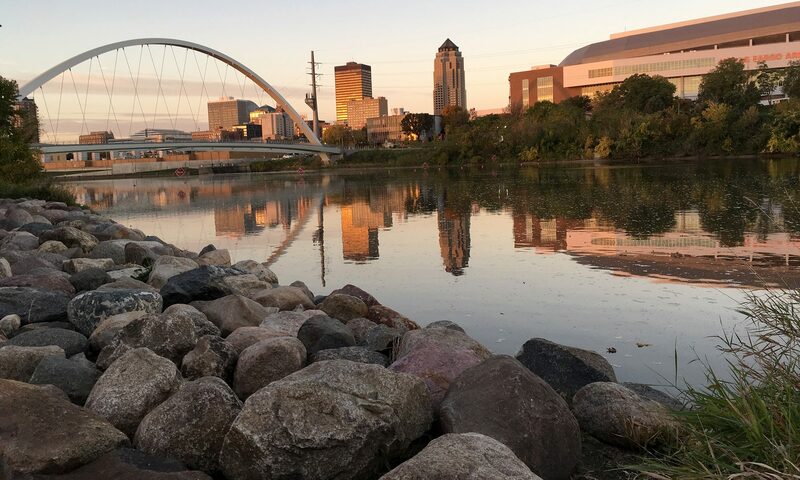 Located on the Principal River Walk, the Hall is around the corner from the Downtown Farmer’s Market, across the river from Brenton’s Skating Plaza and just a short walk from many other events held in the downtown Des Moines area. The convenient location makes a stop at the Hall fit into any schedule, seamlessly. You can spend all day diving deep into the stories offered by each room, or you can make a quick stop on multiple occasions to round out any downtown experience. Should you wish get involved, Barreca also shared, “The public can participate in two ways. (1) Get involved with the World Food Prize Iowa Hunger Summit or (2) join our Laureate Society and give tours of the Hall of Laureates building to educate others about those that are working to end hunger and inspire the next generation.” Whether looking to get involved, book a venue or just explore your capital city, the World Food Prize Hall of Laureates is waiting for you to visit. You won’t want to pass up the World Food Prize Hall of Laureates experience. Previous PostPrevious 5 Amazing Brunch Restaurants in Des Moines You Should Adventure!